You can still follow our Recipe of the Week, posted every Monday on the books blog - or follow our Facebook page and our Twitter feed to get automatic notifications. 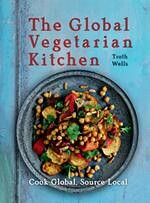 Don’t forget to check out the Global Vegetarian Kitchen page either. This homemade soup has been passed on from mother to daughter to grand-daughter. 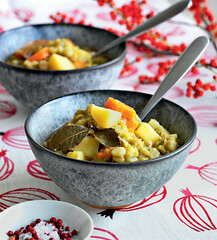 Pea soup (also called snert) is a popular winter soup in the Netherlands. Almost every area has its own version. It is served with a thick slice of homemade bread on a cold wintry evening... and if you can leave it, the soup tastes even better the next day. 1 In a heavy pan or Dutch oven, bring the water to a boil. When it’s boiling, add all the other ingredients, except the salt and pepper. 2 Simmer, covered, for 45 minutes to 1 hour or until the vegetables are done – stir from time to time. Add salt and pepper to taste. Serve with homemade bread. Peter Whittaker and Vanessa Baird review the latest releases in radical publishing. New Internationalist editors review the latest in book releases. This month's reviews include Red Famine, by Anne Applebaum and The Rage, by Julia Ebner. Out of the Wreckage by George Monbiot; Walking on Lava and more: our favourite books of the month, reviewed. October; Good Cop, Bad War; Another Economy is Possibly and others: our book reviews of the month. By introducing bee hives to their fields, Indian farmers are improving productivity – and lives. The impact on children of the deadly virus will outlast the immediate crisis, writes Gabriella Jozwiak. Josh Barrie takes a light-hearted look at the link between food and fundraising. Lydia James uncovers some novel ways to divert food from landfill. Richard Swift interrogates capitalism, exploring the alternatives offered by left-wing politics. Should halal and kosher methods of slaughter be banned? Viva! campaigner Tony Wardle and social commentator Mohammed Ansar go head to head. Britain’s biggest commodities player admits that betting on food prices bad for image, as campaigners push for regulation.